Sound is special. It defines, and defies our understanding. What makes listening to beautiful sound such a special experience? For us, it starts with exceptional design. From black box theaters to large performing arts centers, our certified staff will work with you to build a system that brings your vision to life. At BCI Integrated Solutions Audio Video, we work with you to customize your live sound system to meet the needs of your theater, house of worship, or other live music venue. These are just a few of the ways live sound can be leveraged to turn your entertainment or other commercial facility into the best possible version. Why Use BCI to Install Your Live Sound System? Audiovisual work, particularly live sound, has been one of our most in-demand fields of install for the past twenty years, and for a lot of good reasons. We maintain offices in Tampa, Orlando, and Fort Myers, making installation and service calls to Tampa Bay and the surrounding area easy. We can provide the solution you desire for your venue anywhere in Florida, across the Southeast, or even in the United States. BCI offers a comprehensive process to determine the best integrated solution for your collaboration room project. BCI employs a stringent process to find you the live sound system you need. We aim to use the very best technology compatible with your needs, and most importantly, with the acoustic success of your stadium, house of worship, or other commercial venue in mind. Captiving your audience is a necessity to you, and a passion to us. Let us present you with a system that affords you the control and clarity you need, and give you the tools to enchant visitors and employees alike. Our employees have the experience necessary for any live sound design and install, no matter how complex. 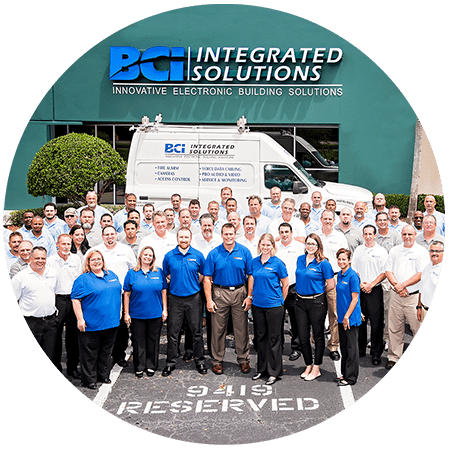 Some BCI representatives, technicians, and other employees are recognized as Certified Technology Specialists by InfoComm (now AVIXA) and possess specialties in Design or Installation. We also have staff certified in Crestron products and installation, as well as several other specialty certifications for products we use to bring you the sound you demand. What Products Do We Use For Our Live Sound Solutions? Electro-Voice speaker arrays guaranteeing excellent sound output throughout your venue. We can create a live sound system from scratch, or build up a new one, based on your specifications. Reach out to us today for a comprehensive analysis and design for your project. Read more about our work on Andretti Karting Orlando.